The Dane County School Board Consortium and the Dane County Superintendent Consortium will hold a news conference at noon on Wednesday, April 10 at the State Capitol in Room 411 South, the Senate’s large meeting room. School board members, superintendents, parents, and business representatives will address the impact of the governor’s proposed budget on our public schools and communities. At least 15 Dane County school districts will be represented. These representatives will be available for questions after the news conference. Located in south central Wisconsin, the Dane County Consortiums were formed to improve educational opportunities for public schools across the Dane County area. The collaboration and partnering of school boards and superintendents allows for an opportunity to share resources, build partnerships and advocate on educational issues. 1963 was a busy year in the United States. Within the span of 12 months, Martin Luther King, Jr. gave his “I Have A Dream” speech, John F. Kennedy was assassinated, Iron Man made his debut in Marvel Comics, and Beatlemania took off. It’s also the year Middleton, which had already been a community for more than a century, officially became a city. It happened on Tuesday, April 9 at 3 p.m., according to that week’s Middleton Times-Tribune. 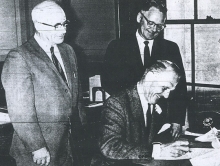 City clerk August Dahlk and new Mayor A.M. McDermid, D.V.M, looked on as Wisconsin Secretary of State Robert C. Zimmerman signed the document changing Middleton from a village to a city. McDermid had won election as Middleton’s first mayor one week earlier, receiving a minority vote of 680 out of 1,636 total votes cast for the office. His nearest opponent, Bruce Bennett, earned 565 votes. Leonard Bruce and Ben Denson came in third and fourth, respectively. 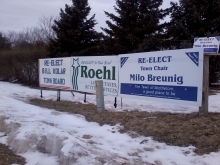 Town of Middleton Board Supervisor Richard Oberle alleged that Town Chair Milo Breunig and supervisors Bill Kolar and Tim Roehl may have violated state open meetings law by taking out a group advertisement in the March 28 Times-Tribune. Oberle contends that the ad copy may show that the three board incumbents discussed town business and “met” to approve it before it was published with their consent. Oberle said Monday that he has asked the Wisconsin Towns Association to look into his allegation. Sitting local candidates defeated their challengers across the board in Tuesday’s election. In the Town of Middleton, Chair Milo Breunig, Seat 1 Supervisor Tim Roehl and Seat 2 Supervisor Bill Kolar all overcame spirited challengers and walked away with decisive victories. None of the challengers - Greg DiMiceli, Cynthia Richson and Troy Alton, respectively - crossed the 40 percent threshold. In their race for a seat on the Middleton-Cross Plains Area School Board, incumbent Diane Hornung trounced Fred Zietz for the second time in a row. Teacher David Dahmen’s write-in campaign was little threat to the candidacy of sitting school board member Jim Greer in Area 1. The incumbents say local government is on solid footing, and their experience can help keep it that ways. The challengers say it’s time for fresh voices, accusing many on the current board from being out of touch with their constituents. What is unique, at least for the Town of Middleton, is the hostile gist of the candidates and their supporters. Middleton Town Board candidates invested in this year’s election like never before, with incumbent Town Chairman Milo Breunig raising the most money of the three candidates who filed statements by Monday, and incumbent Supervisor Tim Roehl spending the most. None of the board members up for re-election Tuesday - Bill Kolar, Roehl and Breunig - were opposed last time around, but they now face aggressive challenges from Troy Alton, Cynthia Richson and Greg DiMiceli, respectively. Breunig, who has been on the board since 1998, said this is the first campaign finance statement he’s ever filed. “I didn’t expect to have to spend more than $1,000 [the threshold for filing a statement]…but with so much misinformation out there, we’re just trying to get fliers out to stay up with it,” Breunig said. When Middletonians fill out their Spring Election ballots on April 2 (or now through early voting) to determine the outcome of races for town board and school board, they will also have the opportunity to answer a countywide referendum question on voter registration. During this window of time, voter registration must be done in person at the Town Hall. After 5 p.m. on Friday, March 29, neither voter registration nor voting will resume until Election Day (Tuesday, April 2). A copy of the sample ballot has been posted to the Town’s website. If you have any questions, call 608-833-5887. The Middleton-Cross Plains Area School Board on Monday unanimously approved a resolution awarding the sale of $59.86 million general obligation school building bonds. Proceeds of the bonds are to fund upcoming additions and renovations at Kromrey and Glacier Creek middle schools, projects that were approved by voter referendum in November of 2012. The winning bid came from Piper Jaffrey & Co., based out of Minneapolis. The interest rate is 3.0957 percent, which equates to $27,222,548 in net interest costs over the life of the borrowing. The vote came three days after Moody’s Investor Services applied a glowing Aaa rating to the district for the issuance. Middleton-Cross Plains is one of only five districts in the state to earn the maximum rating, which Moody’s attributed to a favorable location within the greater Madison economy, a growing population and robust general fund. American Transmission Co. has energized the completed 32-mile, 345-kilovolt Rockdale-West Middleton Transmission Line. In 2009, after nearly two years of regulatory review, the PSC ordered a portion of the line to be built along the Beltline Highway.